I’m Micki and I blog at Confessions of an ADD Housewife. To answer your questions…yes, I do have ADD. I also have six children (ages 16 to 4), and two years ago my husband and I moved in to our dream house (DH says it’s his nightmare). It’s a 104 year old American Foursquare and needs a lot of work. We’re slowly working on the house because we’re doing this all on a cash budget! 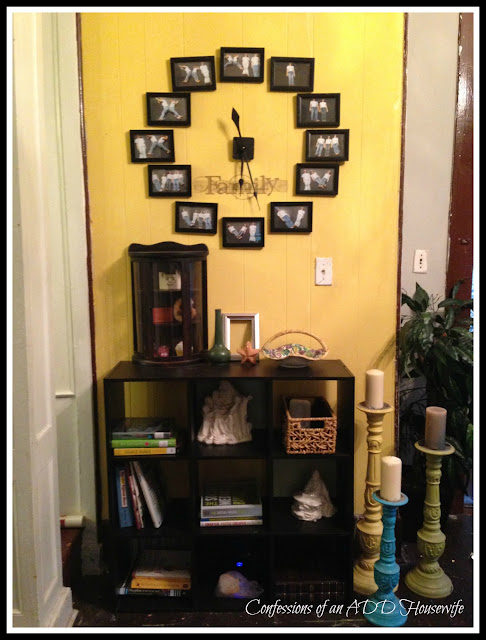 My plan is to transform one room at a time. This year my goal was to work on the grand foyer. Don’t worry, it’s not nearly as fancy as it sounds… I mean, up until this past February, it had 2X4s nailed together instead of a bannister. After choosing paint, filling in the wood paneling, and finally getting a proper bannister… I wanted to do something fun and decorative for the space. I bribed my kids to go outside and make the shape of roman numerals so I could create a very unique clock. The kids weren’t necessarily thrilled with the idea. In fact, everyone (including my husband) told me I was being pretty crazy about this. The kids didn’t understand why they had to wear matching outfits. And when the pictures came back, we discovered that some of them were vertical and some were horizontal. Thank goodness for good quality photo editing software! The clock kit itself left something to be desired — like directions! I had an extra piece…and still no idea where it goes. The clock mechanism works, so that’s all that matters. It was also a good excuse to use the little wall decal I found at the dollar store. It says Family: A gift that lasts forever… it’s even kind of time related.The 4×6 frames were also found at the dollar store. 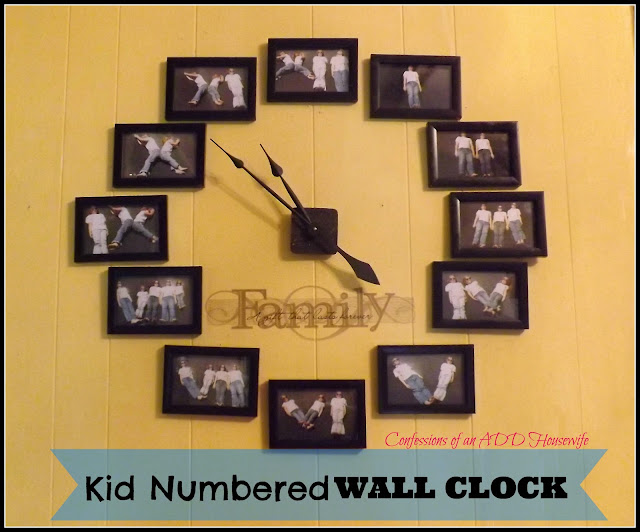 Considering the cost of a large wall clock, let alone one that is completely custom, this project was very affordable and not very difficult at all! Oh my! This is pure genius. I love the idea…so unique, brilliant, and also original. What a great idea! This is going on Pinterest, people need to know they can have a custom made clocks with their kids! And if you don’t have enough kids, enlist the husband, dog, neighbors…. My daughter informs me daily when it is “between two and four”. She thinks she is owed a slushie just because it’s half-price. Um, no, child. Nice try though! ha! Wher did tou get the clock mechanism? I’m not sure where Micki got it, but I have seen them at Michaels. Looks like a great DIY project that will involve the kids, I think they will going to love this! Great wall decor with personal touch!